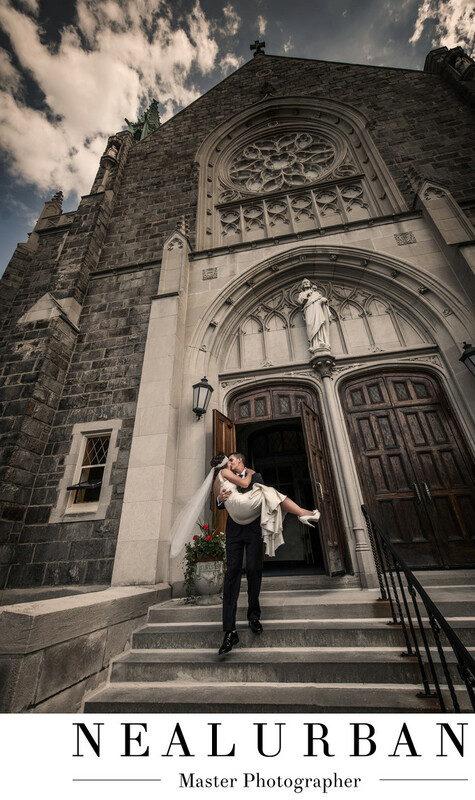 We love photographing weddings at St. Joseph University in Buffalo. It is so pretty. Jessica and Pete had their ceremony there, then reception at Byblos Niagara Resort and Spa (formerly the Holiday Inn Grand Island). We went for portraits at the Herschell Carousell Museum in North Tonawanda. But, first we took advantage of this beautiful church for photos. This bride and groom had an amazing connection. Every moment was so intimate, even when their bridal party was around. They were up for anything too! They were super daring. For their engagement session, we did some photos at a basketball court at Delaware Park. Jessica wore a party dress and heels. She let Pete jump over her to slam dunk the basketball! It turned out to be a great image too. It definitely showed the true personalities of this lovely couple. What to say about this image. The groom picked up his wife and slowly walked her down the church steps. He did this all while kissing her. He actually walked down all of the steps without looking. We were very impressed! Neal decided to shoot this angle because there were some great fluffy clouds in the sky. He shot from the sidewalk and up to capture the church as well. I love how it looks like the church goes right into the sky! Location: 3269 Main St. Buffalo, NY 14214 United States.